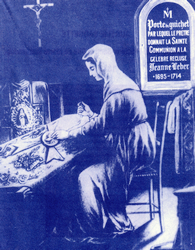 Blessed Jeanne Leber is a native Canadian Saint, born in January 1662 at Montreal. She was the only daughter of a young immigrant couple from Normandy in France, and the godchild of two of the city's founders, Monsieur de Maisonneuve and Mademoiselle Jeanne Mance, foundress of the city's first hospital. The little girl often asked her godmother profound questions concerning religion, such that the Hospital nuns were amazed. Her parents cultivated the excellent qualities of their daughter, and she was sent to be educated in Quebec City by the Ursuline nuns. Jeanne spent hours praying before the Blessed Sacrament, thus showing from her early years her tendency toward a purely contemplative life. She used to talk with the Angels, and she charmed everyone by her gentleness and simplicity. She was gay in company and accepted willingly the roles she was assigned to play in the little dramatic presentations of her school. One day, as Christmas was nearing, she asked to play the role of the Infant Jesus. The others were surprised and questioned her as to her reason. She answered gravely: The Divine Child does not say a word and does not move, and I would like to imitate Him in all things! At the age of fifteen she returned to Montreal, to continue her formation under the supervision of Saint Marguerite Bourgeoys, the foundress there of another new missionary Community, The Congregation of Notre Dame, for the training of the young. In 1680 Jeanne's vocation was studied, after she had made a private vow of perpetual virginity at the age of seventeen, which a priest ratified. A close friend who like herself had wanted to serve God alone, died suddenly; and Jeanne's resolution was strengthened at the sight of the profound peace on the countenance of her deceased and dear companion. She wanted to imitate Catherine of Siena, and make herself a recluse in her father's house. She refused the offer of a brilliant marriage; her confessor felt he could not oppose her pious intention but required that she obtain her parents' consent. They did not long oppose her, for her director from childhood, a priest of Saint Sulpice, Monsieur Seguenot, favored her vocation. She remained submissive to her director until her death, and never sought any other. Never would her determination be altered. Jeanne said: I must die to the world. Long live Jesus! But the emission of solemn vows which she ardently desired to pronounce, was prudently deferred for several years. After the death of her mother, as a recluse in a house of the Congregation of Notre Dame she was lodged very close to the Tabernacle, the source of her hope and her strength; her room adjoined the Chapel wall against which it was placed. She observed a very strict poverty in clothing, shoes, furnishings; she took a common and rude nourishment, often limiting herself to bread and water, or taking scarcely enough to sustain her life. During her twenty years in this convent, she rose every day at 4 o'clock, from Easter until November 1st, and the rest of the year at 4:30. She recited the Office of the Blessed Virgin and heard Holy Mass; she did spiritual reading twice and offered several hours of mental prayer every day. She rose every night for another hour of prayer. To avoid any idleness she did handwork, sewing or knitting for the poor, or made sacerdotal vestments or altar decorations. She was very expert in embroidery, and worked with wool, silk, gold and silver thread with equal competence, making her own patterns without ever having studied drawing and design. She was said to have furnished all of Montreal with chasubles, copes, dalmatics, altar cloths and other precious articles for its churches. In 1714 she fell ill with an oppression of the chest and fever, and was obliged to remain in bed and commanded to use sheets and a mattress, which she had never done. She recognized that her last hour was at hand and disposed of everything in her usage. She begged pardon when her cough became uncontrollable and despite her efforts not to do so, disturbed those in the chapel adjoining her humble cell. She died on October 3, 1714, at the age of fifty-two years. Jeanne LeBer, Première Recluse du Canada Français by Marie Beaupré (Editions ACF: Montreal, 1939); Dans le nid d'Aiglons, la Colombe,by Leo-Paul Desrosiers (Fides: Montreal, 1963); Jeanne LeBer, by Juliette Lavergne. Brochure (Fides: Montreal, 1947). Gladly will I glory in my infirmities, that the strength of Christ may dwell in me.